Mmmm … grilled beef, stuffed with melted blue cheese, nestled on a toasted bun loaded with tomato, lettuce, red onion, ketchup and a squirt of Dijon mustard. 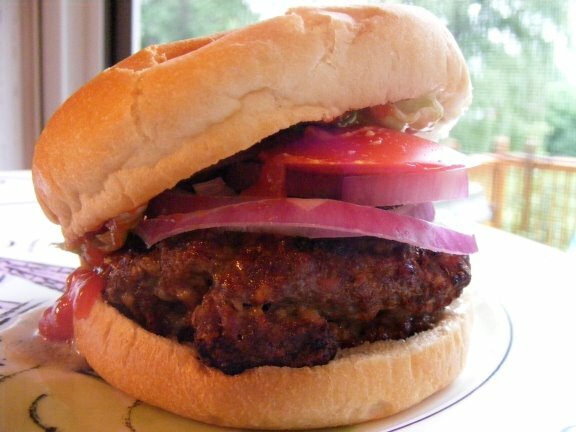 It’s the most flavorful, satisfying burger I’ve had in a long, long time. Enjoy and happy Independence Day! Grease grill with oil; preheat grill. Grind bread in a food processor until finely ground, about 30 seconds. Place breadcrumbs in a large bowl, add milk and toss mixture with a fork to moisten. Add salt, pepper, and beef to breadcrumb mixture, stirring just until combined. Divide meat mixture into 16 equal portions, shaping each into a patty. Spoon a tablespoon of blue cheese into the center one patty and top with another patty, pinching edges to seal. Repeat until you have 8 blue cheese stuffed patties. Place patties on grill and cook for 4 minutes on each side or until desired degree of doneness. Serve patties on toasted rolls with desired toppings.